First of all, I would like to thank everyone who attended our November presentation "Vintage film of 40's, 50's and 60's". 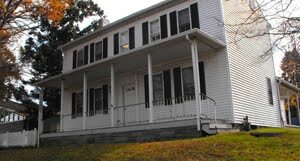 Our Historical Society is alive and growing. The need to expand is increasingly becoming larger and with the co-operation of St. Stan's Community Center and the St. Faustina's Parish we will have access to the new facility for events such as this. Unfortunately, while it is in its construction phase the Center is not available. Our home, the Samantha Mill house is quite adequate for housing our business needs but undersized for presentations such as this. With the growing interest in our Society we hope we can better serve our community. We apologize for any inconvenience we may have caused you and plan to present the films again in the spring at the new facility. On Thursday evening of the 29th the Historical Society gave its presentation to about 30 guests whom tightly packed our limited seating area. The presentation was on early events in Nanticoke donated to the Historical Society. Chet Zaremba, whom took on the task of acquiring and transferring the films to digital, gave the presentation. 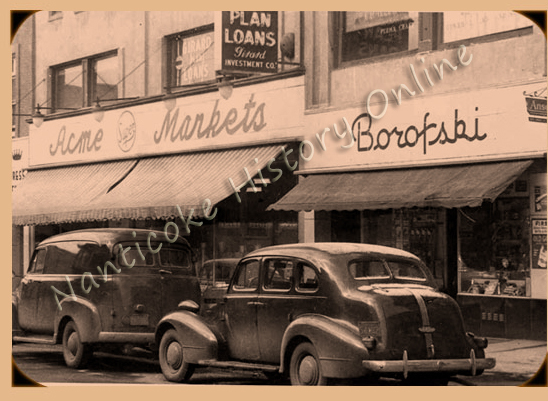 Years ago in Nanticoke there was a photo store, Borofski’s photo. Chet Zaremba got know Norm Borofski, the son. Then last year, when he passed away these films were found in his basement. We were able to acquire these films through the people who did the house sale, a store in Plymouth called Yesterday’s Treasure’s an antique store. When they realized the historical value they donated them to the Nanticoke Historical Society. The original films were on 8 mm and 16 mm formats. We had taken four of the most significant films and had them transferred to a digital format for a presentation such as this. The first film of WWII vintage were made somewhere around the time of 1942-1944 and showed enlistees or draftees boarding a train in Nanticoke leaving for the 2nd World War. The Pennsylvania Railroad rail station, by recollection of some of the attending guests, was located down on Lower Broadway. The first film only ran 4 minutes, but the significance was that they were in color. Considering the age the images were quite clear and the transfer process preserved and enhanced the original media. The film also showed a parade and the crowd that came to see the boys who went off to war. At the time Nanticoke had two train stations a freight station and a passenger station. In the film you could see the train arrive, the boys board the train and the train leaving. A second film in B&W showed an early 6 County Firemen’s Convention Parade, showed Nanticoke in a way that probably few remember with streets filled with busy shops and businesses and crowds of people. Guests pointed out how slim everyone was and how people were well groomed and dressed and how the Ladies all had worn hats. Fire apparatus was then all open cab and some guests could identify the years in which the machines were made, some dating back into the 1940’s. Visiting companies from Hazelton and Tamaqua could be seen. A third film showed a high school football game. Players had no pads and referees wore no stripped uniforms. The old high school stadium could be seen. Chet continued the presentation with photos of Nanticoke selected from his vast library. Photos showed Main Street Nanticoke from the pre 1900’s. Included were photos of the old State Theater, Frank Matheson’s Nanticoke Hotel, the old post office, the old Acme, Al Fink Oldsmobile Dealership. Photos showed store fronts which had window displays and what Chet referred to as Islands or window displays with passage ways to the main entrance to the store on either side. Photos showing old telephone poles had up to seven cross members to support a separate subscriber wire line for each telephone customer. Chet also showed photos of Diamonds Candy Store after the closing with ornate trim, seating booths and malt shop decor. Everyone immensely enjoyed the presentation and we are looking forward to making it again when we can use the facility. Katy Sweeny again did an outstanding job with a unique tree decorating design for our entry. The theme of course was history and the ornaments were cleverly crafted vintage photos of Nanticoke. The event feature delectable creations from the Culinary Art students with an assortment of baked Holiday treats. The event was held on Friday Nov. 30th in the Conference Center of the LCCC Campus off of Prospect Street and was open to the public from 6:00 pm to 8:00 pm.